Paddleboards are big, tough to maneuver out of water, and an expensive investment. All of these are reasons why you need a paddleboard bag for your SUP when you're storing it at home or in your garage, moving it from your paddleboard rack, riding with it on your SUP car roof rack, or even keeping it at the water's edge while you're in between sessions. 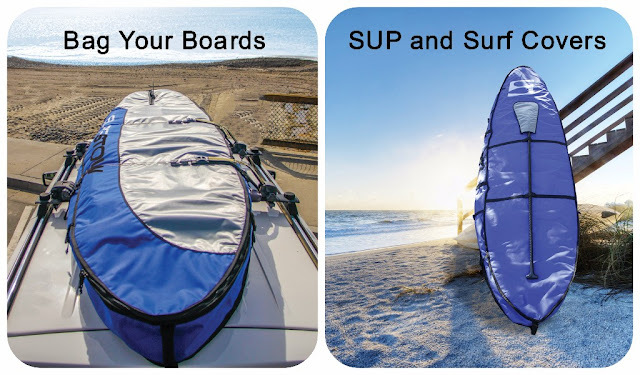 SUP bags will protect your board from dings and damages, over sun exposure, and in general keep it clean and protected. There are a variety of types - thicknesses, widths, length - to fit all your different paddleboards, like race, touring, surf and more. SUP Sock - this is a thin, knitted layer of protection for your SUP. It's lightweight, slips on easily, and pulls closed with a drawstring. A sock is great for storing your paddleboard at home, taking it on short trips, or while your board is hanging out of the water. There's no padding in a paddle board sock; just the thin sock material to cover your SUP. SUP Day Bag - the day bag gets its name from its best use, covering your paddleboard for the day, like on day trips to the water and back. 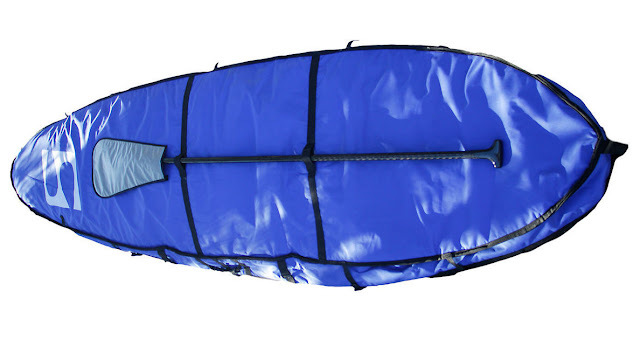 It comes with a reflective outer material to reflect the sun and make sure your SUP doesn't overheat inside the bag. The paddleboard bag provides some padding against damage to your paddle board while it's in transit. SUP Travel Bag - if you've got a SUP race coming up that you're traveling to, or have a big paddle expedition, you need a paddle board travel bag. These bags come padded with thick padding to keep your board fully protected. Many include a paddle holder for your paddles in transit, and come with pockets, straps, and plenty of other features to make sure your SUP travel experience is a great one, at least from your board's perspective.